And what's wrong with this freaking lady? It's no secret -- Amara loves princesses. And honestly, I'm an Asian princess in my own right. So why would this ultra-feminist nazi bash innocent little girls and their mothers? Sometimes, it's good for a child to role play...as long as it stays that - play. While I hope I have provide Amara a good life, I know there are other children not that lucky. And role playing has to help them cope with the harsh realities of the world. 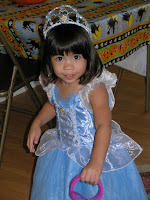 So be it if Amara wants to be Cinderella or Ariel or Princess Genevieve or any other prinecss. More power to that little Diva.